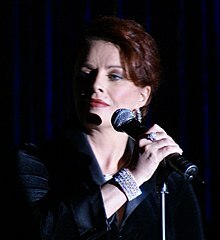 Sheena Easton (born Sheena Shirley Orr; 27 April 1959), is a Scottish singer. She was very popular during the 1980s and the 1990s. She has won several Grammy Awards. She had many charting singles and albums including "Morning Train," "For Your Eyes Only" and "Sugar Walls." Easton was born in Bellshill, Scotland. ↑ Jason Ankeny. "Sheena Easton". AllMusic. Retrieved 20 February 2016. ↑ 2.0 2.1 "Sheena Easton Biography". Bio/A&E Television Network, LLC. Retrieved 20 February 2016. This page was last changed on 13 November 2018, at 15:55.